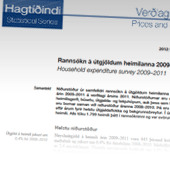 Results from the household expenditure survey 2009-2011 (at 2011 prices) are broken down by type of household, residence and interquartile ranges of disposable income and expenditure. The results are broken down by years, main expenditure groups and social variables. The real expenditures declined by 3.5% from 2008-2010 to 2009-2011.